Night at the races / Tricky Tray! Bring your own food. NO outside beverages allowed! Get ready for a fun night of bingo and fantastic prizes! The Bingo/Tricky Tray will be held on Friday, October 27th at the American Legion in Elmwood Park. Doors open at 6pm, Bingo starts at 7pm. The tickets are $20 each and it includes small pack of tickets for tricky tray. Additional tickets for the tricky tray will be sold separately. All proceeds will go towards the Bombers! Last year was a great success. Help us do it again. Tricky Tray/Night at the Races Fundraising Event! 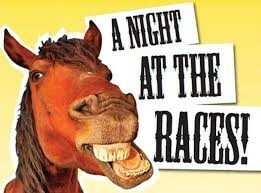 Enjoy a fun filled night of horse racing where you can be the jockey or just place a bet and win. 7 races with audience participation. Then, try your luck at the tricky tray and win some great prizes! NOoutside BEVERAGES allowed Cash Bar! Join us for a fantastic evening of Prizes and Fun! You’ll never experience this much fun in one evening again!